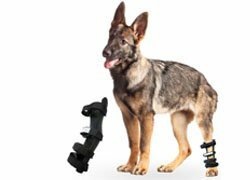 The Walkin' Pet Splint Hock Style will support the hock joint of the dog's rear leg. The Hock Style Splint does not extend under the dog's paw. Sturdy, lightweight design features a cushioned interior and easy to adjust Velcro straps that secure the hock splint in place. Ideal for supporting fracture or sprains. Provides stability for weakness associated with arthritis or injuries to tendons or ligaments. Supports immobilty during post-operative recovery or for rehabilitative treatment. Waterproof and easy to clean design aids in protecting bandages for wound treatment. Size Large accommodates dogs weighing approximately 65-85 pounds and measuring 9 1/2 inches from hock to the end of the longest toe nail.